The Oath of a Probationer I, _______________________ , being of sound mind and body, on this ____ day of _____________ [Anno ____ Sol in _______ ° of _______] do hereby resolve: in the Presence of _________________________, a Neophyte of the A∴A∴: To prosecute the Great Work: which is, to obtain a scientific knowledge of the nature and powers of my own being. May the A∴A∴ crown the work, lend me of Its wisdom in the work, enable me to understand the work! Reverence, duty, sympathy, devotion, assiduity, trust do I bring to the A∴A∴ and in one year from this date may I be admitted to the knowledge and conversation of the A∴A∴! 0. Let any person be received by a Neophyte, the latter being responsible to his Zelator. 2. The aspirant to the A∴A∴ shall hear the Lection (Liber LXI) and this note of his office; IF HE WILL, shall then procure the robe of a Probationer; shall choose with deep forethought and intense solemnity a motto. 3. On reception he shall receive the robe, sign the form provided and repeat the oath as appointed, and receive the First Volume of the Book. 4. 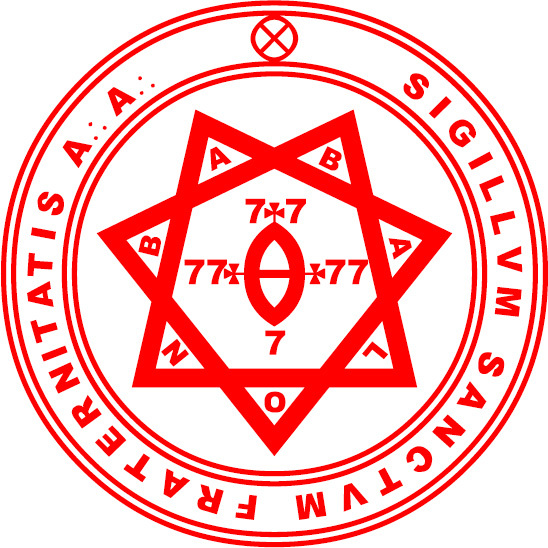 He shall commit a chapter of Liber LXV to memory; and furthermore, he shall study the Publications of the A∴A∴ in Class B, and apply himself to such practices of Scientific Illuminism as seemeth him good. 5. Beside all this, he shall perform any tasks that the A∴A∴ may see fit to lay upon him. Let him be mindful that the word Probationer is no idle term, but that the Brothers will in many a subtle way prove him, when he knoweth it not. 6. When the sun shall next enter the sign under which he hath been received, his initiation may be granted unto him. He shall keep himself free from all other engagements for one whole week from that date. 7. He may at any moment withdraw from his association with the A∴A∴ simply notifying the Neophyte who introduced him. One month before the completion of his year, he shall deliver a copy of the record to the Neophyte introducing, and repeat to him his chosen chapter of Liber LXV. 9. He shall hold himself chaste, and reverent toward his body, for that the ordeal of initiation is no light one. This is of peculiar importance in the last two months of his Probation. It explains the essence of the New Law in a very simple manner. An extended and elaborate commentary or the Book of the Law, in the form of a letter from the Master Therion to his magical son. This book is an account of the sending forth of the Master by the A∴A∴ and an explanation of his mission. Being of the Angels of the thirty Æthyrs the Vision and the Voice. Besides being the classical account of the thirty Æthyrs and a model of all visions, the cries of the Angels should be regarded accurate and the doctrine of the function of the Great White Brotherhood understood as the foundation of the Aspiratation of the Adept. The account of the Master of the Temple should in particular be taken as authentic. The instruction in the 8th Æthyr pertains to Class D, i.e. it is an Official Ritual, and the same remarks apply to the account of the proper method of invoking Æthyrs given in the 18th Æthyr. An account of the relations of the Aspirant with his Holy Guardian Angel. This book is given to Probationers, as the attainment of the Knowledge and Conversation of the Holy Guardian Angel is the Crown of the Outer College. Similarly Liber VII. is given to Neophytes, as the grade of Master of the Temple is the next resting-place, and Liber CCXX. to Zelator, since that carries him to the highest of all possible grades. Liber XXVII. is given to the Practicus, as in this book is the ultimate foundation of the highest theoretical Qabalah, and Liber DDCCXIII. to the Philosophus, as it is the foundation of the highest practical Qabalah. The instructions given in this book are too loose to find place in the Class D publications. Instructions given for elementary study of the Qabalah, Assumption of God forms, Vibration of Divine Names, the Rituals of Pentagram and Hexagram, and their uses in production and invocation, a method of attaining astral visions so called, and an instruction in the practice called Rising on the Planes. This book instructs the aspirant in the necessity of keeping a record. Suggests methods of testing physical clairvoyance. Gives instruction in Asana, Pranayama and Dharana, and advises the application of tests to the physical body , in order that the student may thoroughly understand his own limitations. The Preliminary Lection, including the History Lection. Explains the actual history of the origin of the present movement. Its statements are accurate in the ordinary sense of the word. The object of the book is to discount Mythopoeia. An account of A∴A∴ first written in the language of his period by the Councillor Von Eckarthausen, and now revised and rewritten in the Universal Cipher. This is the chapter called the “Star Ruby” in the Book of Lies. It is an improved form of the “lesser” ritual of the Pentagram. An instruction for adoration of the Sun four times daily, with the object of composing the mind to meditation and of regularizing the practices. A special instruction for the Promulgation of the Law. This is the first and most important duty of every Aspirant of whatever grade. It builds up in him the Character and Karma which form the Spine of Attainment. A general account in elementary terms of magical and mystical powers. In four parts: (I) Mysticism (a) Magical Theory (3) Magical Practice (4) The Law. An enumeration of the Official Publications of the A∴A∴ with a brief description of the contents of each book.This course of reading will furnish the Probationer with a thorough general knowledge of the whole system of Attainment, and of the practices tending to this goal, so that he may choose freely as to what way he will take in his Beginning. For this is always left by the A∴A∴ to his Free Will; They only begin to advise and criticize him on the information supplied to Them by himself in the Magical Record which he prepares for Their Instruction.